We are the leading manufacturer and supplier of Soil Testing Equipment. In which includes Triaxial Test Apparatus, Triaxial Cell and Brass Sieves. 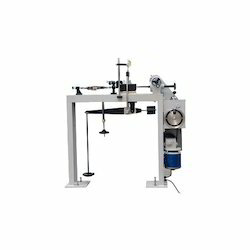 Our company is engaged in the manufacture, export, and supply of Triaxial Test Apparatus that finds a major application in the determination of stress-strain relationship. Owing to the accurate measurement and low power consumption, the proffered range is massively desired. Stepper motor drive and microprocessor controlled drive mechanisms are used for the apparatus. 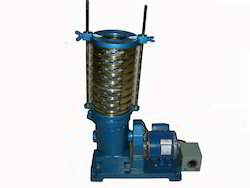 We are one of the celebrated manufacturers, exporters, and suppliers of Vane Shear Apparatus that is equipped with an adjustable torque head. Due to the excellent rate of rotation and less power supply, the proffered collection is widely desired in the industry. Vane shear apparatus is examined for its performance before handing over to the customers. 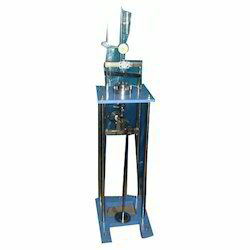 Being one of the eminent manufacturers and suppliers, we are involved in offering precisely designed and developed Direct Shear Test Apparatus Electronic. Manufactured in accordance with the present industry standards, the offered apparatus comes in great capacity and an excellent range of maximum overload. Proffered selection is provided at affordable rates. 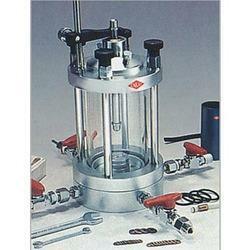 Enables the determination of liquid limit simply and quickly. The unit is supplied complete with a stainless steel penetration test cone 35 mm long with a smooth polished surface with an angle of 30º. The facility exists for adjusting cone height in relation to the specimen. 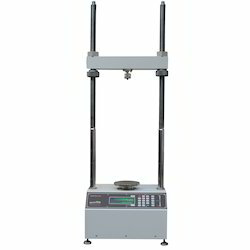 Laboratory California Bearing Ratio Test Apparatus is specifically designed by our professionals to fulfill the varied client requirements. Used in the construction of roads, this accurate and efficient apparatus is fitted to the underside of a mobile frame or mounted on rolled steel joist cantilevered from truck’s back. These can be acquired in different types of models. Loading jack with u bracket, capacity 50kN (5,000 kgf) lift of 50mm. 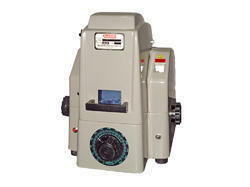 This is specially designed for use with Field CBR test apparatus. It consists of a hand operated. single speed 1.25mm / min, screw jack fitted with a U-bracket. A hexagonal adapter is provided to fix a proving ring. A thrust bar, which passes through the U-bracket is screwed on to a proving ring (supplied at extra cost) which protects the proving ring when the loading is eccentric. Swivel Head, for the loading jack. Detachable handle of around 150mm radius. CBR Mould, Zinc plated steel mould of cylindrical shape having 150mm internal diameter and 175mm height are supplied with an extension collar of 51 mm height and perforated base-plate (1.6mm dia. hole) that can be fitted to either end of the mould. 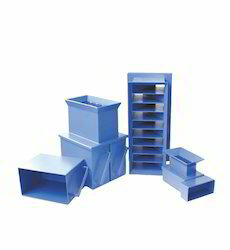 Each set consists of 6 molds. Ball seating attachment are use for testing over undulating ground to ensure jack, load measuring ring and penetration piston are truly vertical. 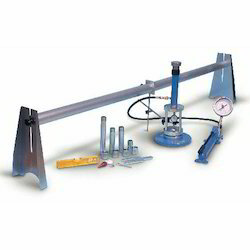 Datum Bar Assembly, consisting of two tripod stands and 1 m long datum bar. Connector set consists of eight connectors for coupling the penetration piston and proving ring assembly, either directly to through extension pieces. Annular surcharge weight, (Metallic & galvanized) 2.5 kg, 147 mm dia with 53 cm dia slot. 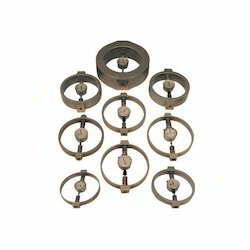 Each set consists of 6 annular surcharge weights. 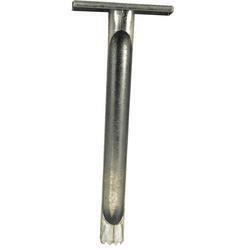 Slotted Metal weight, (Metallic & galvanized) 2.5 kg, 147 mm dia with 53 cm dia central hole. Each set consists of 6 slotted surcharges. 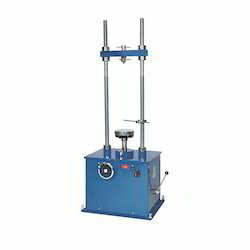 Conversion frame, mechanical jack for laboratory CBR test a frame 45 kN capacity of two column construction with an overhead beam are supplied complete with stabilizing bar. Expansion measuring apparatus, swell plate of 149.2 mm diameter and is perforated with 1.6mm diameter holes. This item is supplied along with tripod fitted with a dial gauge. Each set consists of 6 nos. of swell-plates and 2 nos. each of tripods & dial-gauges. EK DS-51001A Halves of the Shear Box 2 Nos. EK DS-51001B Plane Gripper Plate 2 Nos. EK DS-51001C Perforated Gripper Plate 2 Nos. EK DS-51001D Porous Stone 2 Nos. EK DS-51001E Top Loading Pad 1 No. EK DS-51001F Base Plate 1 No. EK DS-51005 Specimen Cutter 1 No. For the Riffle Sample Divider rapid collection of true representative samples from aggregates, sand, and fillers, sample divider is required. 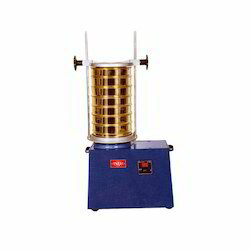 Riffle Sample Divider consists of a metal box fitted with a series of chutes of equal width which discharge the material alternatively in opposite directions into separate pans. The chutes of the riffle are steep enough to allow rapid flow of the material. Supplied complete with three containers. Model cat no. Slot width mm No of slots Approx.Capacity of m3. 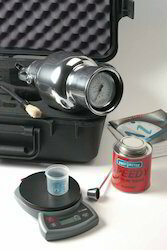 Each Speedy Moisture Meter instrument is supplied complete in a carrying case fitted with counterpoised balance for weighing the sample, scoop for measuring carbide reagent, a set of steel balls and a cleaning brush. Using a speedy moisture meter, the moisture content of soil, sand and other fine-grained material can be obtained quickly with reasonable accuracy. 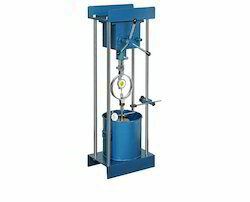 The test technique is based on the fact that water will react with calcium carbide to form acetylene gas and the quantity of gas formed is directly proportional to the water present, leaving a surplus of the chemical used in the test. The quantity of acetylene gas produced is indicated on a built-in pressure gauge which is calibrated in percentage of moisture on a wet weight basis. A conversion formula gives the corresponding moisture content based on dry weight. This Infra-Red Moisture Meter has been designed for rapid and accurate determination of the moisture content of a wide variety of materials. It is a torsion wire instrument, the torque being applied to one end of the wire by means of a calibrated drum to balance the loss of weight as the test sample dries under infrared radiation. The speed of drying (about 30 min) thus obtained combined with the frictionless balancing system gives the result as accurate as those obtained by standard oven drying method. Since drying and weighing are simultaneous, it is especially useful for determination of moisture in substances, that quickly reabsorbs moisture after drying. The infrared radiation is controlled by a voltage regulator and thereby provides excellent heat control. The instrument is provided with an indicator lamp, which glows when the unit is switched on. 50 Hz, single phase AC supply. The mechanical method known as the Casagrande Method has been the standardized test in Soil Mechanics for many years. 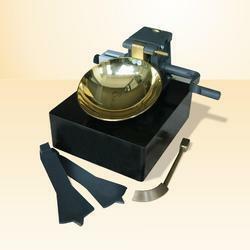 Satisfies International Standards Motorized model with integral blow counter available The Liquid Limit Device consists of a hard rubber base carrying a sliding carriage assembly to which a brass cup is hinged. The cup is raised and allowed to fall through a height of 1 cm on to the hard rubber base, by the help of a lead screw provided at the back of the sliding carriage. 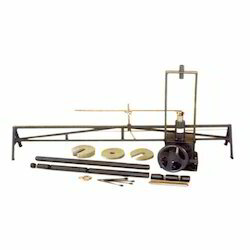 Supplied complete with Casagrande Grooving Tool and Gauge Block (Type A of IS: 9259). The Shrinkage Limit Set of a soil is defined as the moisture content after which any further reduction of moisture will not cause volume reduction. The shrinkage of clayey soil can be very significant. A fully saturated soil specimen is allowed to dry in free air and its volume is measured repeatedly by immersing in a mercury bath. From the data obtained from this test, Shrinkage Limit, Shrinkage Ratio, Shrinkage Index and Volumetric Shrinkage can be calculated. The choice of puddle-clay materials is often governed by the results obtained from this test. 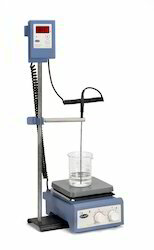 Pycnometer Specific Gravity is the ratio of the weight in air of a given volume of a material at a standard temperature to the weight in air of an equal volume of distilled water at the same stated temperature. The equipment mentioned below can be used to test a wide range of materials from clay to sand and gravel smaller than 10 mm. To make the process of sieving easier and quicker, electrically operated mechanical Motorised Sieve Shaker is offered for dry sieving. The mechanical Sieve Shakers provides a more elaborate and standardized sieving action to produce accurate results and eliminate personal errors involved in manual sieving. On the basis of experience gained in the manufacture of these sieve shakers for more than forty years, considerable improvement has been made in the design and performance of these units. 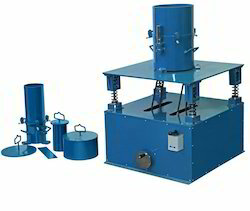 These Sieve Shakers are popularly used not only in soil laboratories but also in a number of industries where sieving is required, such as for ores, refractory materials, minor aggregates, pigments, powdered coal, soap, cement, roofing materials, plastic molding powders, and pharmaceutical. 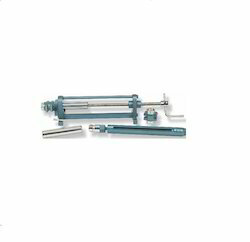 Incorporates High-Speed Stirrer a sliding carriage which is operated without transmitting vibrations to a pipette or to sedimentation tube when the pipette is inserted and withdrawn from the liquid. 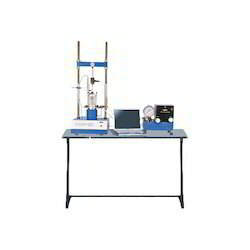 Supplied complete with EKE 05601 Dispersion Cup Designed as a compact bench-mounted laboratory Stirrer for the pretreatment stage of soils before particle size analysis. The mixer spindle operates within a Dispersion Cup which can be fitted with an antis plashing Baffle to improve the efficiency of mixing. Two pillar type Lightweight and Sturdy in construction Ideal for using in the mobile laboratory also. 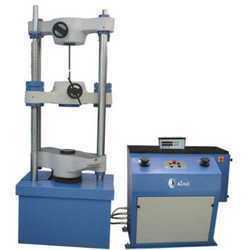 This load frame is designed for conducting unconfined, triaxial, CBR and other routine tests. 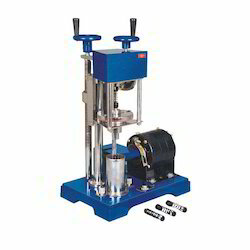 Soil Compaction Test Apparatus, Manual is a fundamental requirement for the construction of earth fill for dams, reservoirs, canal embankments, highways, railways, and runways. The relationship between soil moisture content and compacted dry density is very useful for deciding construction specifications and quality control of compacted earthfill. While designing earth or earth retaining structure, the strength and deformation behavior of soil is evaluated by testing soil specimen compacted to the density as would be achieved during construction The construction quality control is essential to check the density of compacted soil achieved in the field, thereby checking its strength. Product Code: EKE 125 Standard: Standards IS:2720 (Part 15), IS:12287, BS:1377, ASTM D2435. 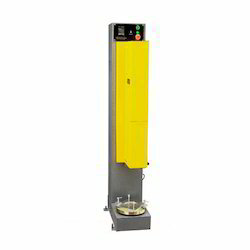 The standard outfit comprises of a fixed ring type of can solid meter cell for testing specimens but the unit is so designed that specimens of varying sizes from 50 mm dia to 100 mm dia can also be tested. Besides, the same loading unit can be used with a floating ring Consolidation Apparatus meter cells, which can be supplied at extra cost. The standard outfit is supplied with a set of weights to give a total pressure of 10 kg/cm² (besides a seating load of 0.05 kg/cm² on the specimen), but an additional set of weights are required to reach the full. The necessary accessories to perform the permeability test of the 'Varying Head' type can also be provided at extra cost. Electronic Measurement System Digital readout reduces the possibility of operator error Direct reading. A plug-in transducer module system Facility for connecting the readout unit to compatible logging or printing system Electronic sensing parts are easy to couple with existing Emkay Models. Electronic measurement of the vertical consolidation of soil specimen, using a displacement transducer connected to a precalibrated readout unit, offers an operator all the advantages of a digital display without the errors which can occur when reading conventional dial gauges. 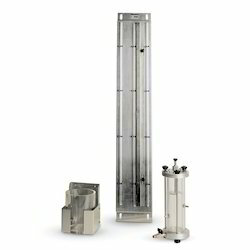 The basic equipment for monitoring a test comprises a readout unit and one transducer module for connection to one consolidation frame. Consolidation is measured by mounting the transducer in the same position as a conventional dial gauge. The movement of the transducer stem acts in exactly the same way as would the dial gauge spindle and is converted into an electrical signal. The signal is then displayed in true engineering units on the readout unit. For three gang unit or six gang unit, 3 or 6 transducer modules are used, but the readout unit is of three or six channel type. The constituents of various models are detailed in the table given on the next page. Consolidation of clay deposits leads to distress in buildings such as cracks and failures. Consolidation is the reduction of the volume of soil due to the expulsion of water from its pore space caused by sustained loading. 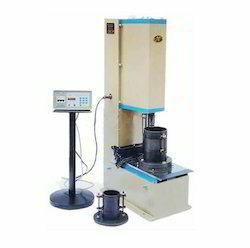 The Plate Bearing Test Apparatus is essentially a model test of foundations and gives the load-deformation characteristics for determining the ultimate bearing capacity of foundations. 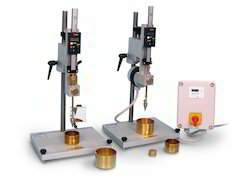 This test is a standard technique for determining bearing capacity of soils and the results of other methods are compared and calibrated with the values obtained with plate bearing test. In this method, a steel plate is subjected to a gradual increment of load and the corresponding settlement is noted. The Ultimate Bearing Capacity is taken as the load at which the settlement increases at a rapid rate. Power supply: 3.6 V NiMH rechargeable battery. The limits of complementary error of the instrument at voltage changing: 3.6 Volts to 2.8 Volts. The probability of no-failure operation, not less than 0.92 per 2000 hrs. The average failure time is set for standard conditions for operation. We are among the leading names of the market that manufactures, exports and supplies Triaxial Cell. The offered cells can be easily split by releasing four tie rods and kept leak proof up to a certain fluid pressure. Also, these triaxial cells come with an oil plug and air vent providing a thin layer of oil over water. Our customers can avail the range in standardized packaging. 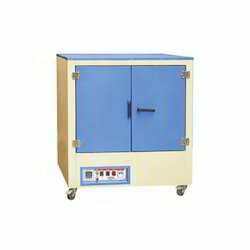 We are among the leading names in the industry that manufactures and exports Automatic Compactor that is widely used for Proctor or CBR tests. These compactors operate on a high definition self-tensioning chain drive lift mechanism and are one motor driven. Due to the tough construction, longer functional life and operational fluency, these are massively asked for. Compaction Rate: 20 blows/ min. Motorized Sieve Shaker is manufactured, supplied and exported by us in several specifications to meet the diversified client needs. Characterized by powerful motor and magnificent capacity, this series is also famous in the industry for its consistent operation and ease of maintenance. 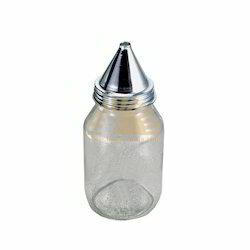 Clients can obtain these sieve shakers in tamper proof packaging. We are one of the celebrated names in the field, which engage in the manufacture, supply and export of a massive selection of Integral Proving Rings. Due to the excellent design sensitivity, sturdy construction and huge capacity, these rings are immensely popular among our clients. Integral proving rings are proffered in multiple sizes to fulfill the varied demands of our clients. Enkay Enterprises is concerned with the manufacture, export, and supply of a massive collection of Standard Triaxial Cells that are used for testing samples of different diameters. Proposed selection is manufactured using premium quality raw materials that are procured from our reliable vendors. These are lightweight and come in excellent capacities. This is a Dead-Weight type constant pressure system. 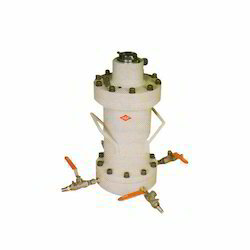 This system consists of an oil pump, continuously driven by an electric motor to provide the required pressure to the Triaxial Cell Chamber. Hand-operated screw-type augers, as well as post hole (blade type) augers, are available in different sizes as listed above. T-piece and a tubular handle. Additional extension rods are available for sampling at the deeper location. EKE 02504: Fall Hammer attached to a flexible rope and drum, operated manually. EKE 0205: Base Assembly for the hammer system with suitable wheels for moving about when attached to a vehichle. EKE 13403: Dynamic Cone Threaded for Type 'A' Rod Coupling. It is desighned to deliver equal impact energy in each blow while performing Standard Penetration Test. This is acheived by providing a trigger mechanism to standardise the height of fall and a suitable guide system for maintaning vertically of guide rod and drill rod assembly. The guide system also maintains their alignment throughout the duration of the test. The system is compact and easy to use, provides maximum safety for the operator. 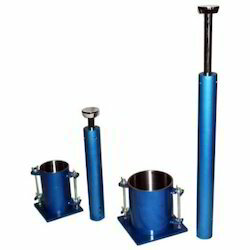 The sample extractors shown in this section meet the requirements of Indian, British, ASTN and AASHTO standards.Soil core specimens can be extracted from sampling tubes with minimum disturbance. Specimens of smaller dia can also be extracted from larger size samples. All proving rings are integral type viz. the loading (outside) bosses are forged integral with the ring body. This ensures that there is no possibility of abutment shift and consequent loss of accuracy in reading that always exists with bolted abutments. 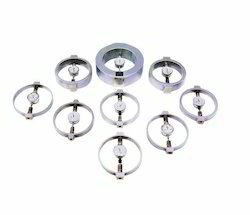 The dial gauge and anvil are mounted on U-brackets clamped to the ring body by set screws. The dial gauge is fitted with a special back cover and a threaded bush, which does not permit any shift from the original dial alignment, coaxial with the loading boss centres, that is set at the factory before calibration. The boss faces are ground and polished and are plane parallel to within 0.02mm total DTI run-out. Tension compression rings have their integral loading bosses male threaded, 1.25" dia, 8 tpi, square thread, 1.25" long. Caps are provided for use when loading in compression. Repeatability is as stipulated in IS:4169. The rings are supplied complete with dial gauge and Works Calibration Chart, individually packed in polished wooden boxes. NPL (India)/ NCCBM Calibration/ NABL Calibration can also be arranged for any proving ring at an additional cost. Proving rings to meet special requirements are also available on request. Separate polished and ground pair of Loading Pads for Compression Proving Rings and pair of Shackles for Tension Proving Rings are provided to suit each proving ring, at extra cost and on request. It is designed to determine the swelling pressure developed by soil specimens moulded to desired densities at known moisture contents, when soaked in water. The load applied to restrain the swelling is transferred to a load measuring proving ring through a perforated swell plate and a load transfer bar. The proving ring is attached to the lead screw of hand operated load frame. A soaking tank is provided for saturating the specimen and the base of the mould has channels and radial grooves with connecting holes. EKE 15509 Slotted Metal Weight, 5 kg, 215 mm to 250 mm dia with 53 mm dia slot 2 Nos. EKE 15510 Slotted Metal Weight, 10 kg, 215 mm to 250 mm dia with 53 mm dia slot 2 Nos. The use of the in-situ CBR apparatus in large road construction projects has increased considerably in recent years. This apparatus, mounted on a rolled steel joist cantilevered from the back of the truck or fitted to the underside of a mobile frame, can be used to determine the bearing capacity of soils quickly and efficiently. This method of testing in-situ, using piston penetration, is useful for determining the load carrying capacity in the field, when the in-place density and water contents are such that the degree of saturation is 80% or greater, when the material is coarse-grained and cohesionless so that it is not affected by changes in the water content and when the material has been in place. Ours is a reputed name in the industry that proffers precisely designed and developed range of Brass Sieves. Manufactured in accordance with the predefined industry standards, these sieves are extremely durable and sturdy in construction. 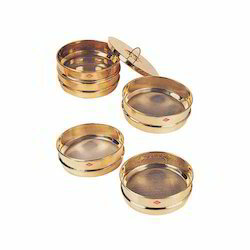 ISS brass sieves are provided in multiple aperture sizes and diameters to meet the varied client needs. Universal Automatic Compactor Invariably in every soil laboratory, compaction and penetration tests on soils are carried out regularly. The electrically operated mechanical compaction process eliminates the tedious hand compaction process and results in a considerable saving of time. 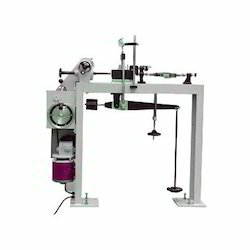 With the rammers provided and two-stroke lengths available, the apparatus can be used to carry out all the normal compaction operations required in soil testing laboratories including the CBR tests. Extension Rod, Eye Hook, Wax container, Methylated Spirit Stove and wax ladle complete as above, in a carrying case. 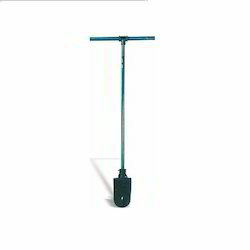 For collecting undisturbed samples of soil at different depths. This kit includes all necessary implements for boring, driving and melting wax. The outfit, in conjunction with samplers, can be used to collect undisturbed samples to a depth of 6 m. If the site conditions permit the depth of operation can be increased by adding extra extension rods. Each sampler is 600 mm long and has a hardened cutting edge. Samplers can be used with 'A' drill rods or EKE 008 Sampling outfit by selecting suitable adapters.